Jack is part of Curb, Southampton’s branch of The Real Junk Food Project, an initiative consisting of volunteers who collect and redistribute food waste. According to Jack, Curb collected 14.5 tonnes of food in 2 years and that’s just using the core 12 volunteers! His interest in the organisation emerged following a free lunch they held here at the Union last year. Jack took part in an event last year which involved living off food waste for the month leading up to the half marathon. He’s doing this again this year, but this time it is more of a fundraiser event, rather than a protest against food waste going to landfill. 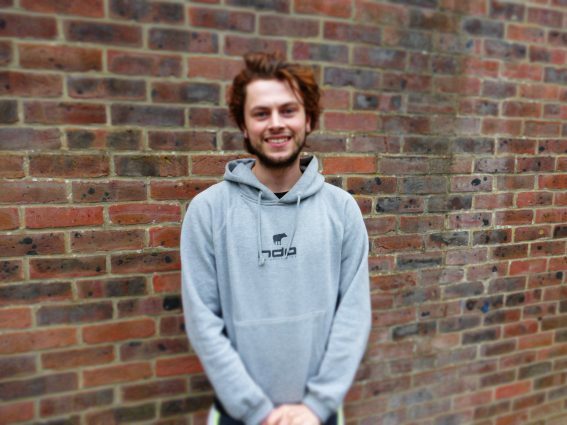 This year, Jack’s taking the freegan life a step further by living purely off food waste for 7 weeks in the run up to the half marathon as part of ‘Race Against Waste’. It should be noted that Jack’s freegan lifestyle is not actually legal. So when we asked him the all-important question: ‘what happens if you get caught? !’ Jack replied: ‘I’ve never been caught but some from Curb have and they were just told to move on. I don’t think much gets done about it because they don’t want the publicity as it’s a controversial topic’. Jack discussed how he believes this lifestyle should be accepted and commented: ‘sell-by dates should be a guideline not an absolute – we need to live by our senses!’ Speaking about the misconception that this lifestyle is dirty and unsafe Jack said: ‘I think people picture me going round house bins and picking out the odd baked bean here and there! But it’s not like that; pretty much everything I take is in packets’. Luckily for Jack, his friends and family are supportive – we’re not surprised when he brings them back sweet treats including 73 sealed pancakes following Pancake Day! When we asked Jack whether he gets nervous rummaging through waste bins, he said: ‘I was nervous when I first started, but now I’m dedicated to the cause I’m much more confident. It’s disgusting the amount we throw away… supermarkets throw away bananas that don’t fit the specification, parsnips that are wonky, it’s crazy!’ Interestingly, Jack explained that he feels his diet has improved since opting for this lifestyle and said: ‘I’ve tried weird things since being freegan like chicory. I didn’t even know what chicory was, but it’s now in my fridge! It’s definitely opened me up to trying new things’. As we see a growing number of people going veggie and vegan (*pssssttt* have you tried The Stag’s new Vegan Paninis?! ), Jack recommended The Art House and The Rockstone pub as hotspots in Southampton. All the money Jack raises will go to Curb and help them run their events and redistribute waste. This includes things like paying for a stall at a vegan fair, hiring out a venue, paying for petrol for the van.